Update/create Word and PowerPoint content (text, tables, and charts) based on Excel data and calculations. Automate your customer proposals, recurring business/financial reports, custom engineering datasheets, and more! Quick/secure install via the Microsoft Office Store. 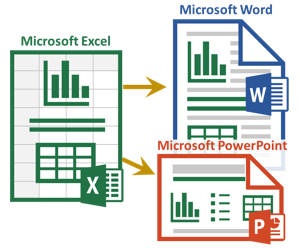 The Excel-to-Word Document Automation Add-in automates updating of Excel-based content into Word and PowerPoint documents. Updatable content includes text, tables, and charts. It also makes it easy to link the “dynamic” content to be updated. Update any new or existing Word/PowerPoint document with content from any new or existing Excel workbook. It is easy to link existing spreadsheets and documents. The add-in includes sample documents (an Excel ROI calculator and a Word business case) to get you started. The free "Basic" version does not require registration or login and is a great option to evaluate the add-in and for users with basic content automation needs. Fee-based versions are also available to enable premium and enterprise features and require an AnalysisPlace.com account. Easy to get started: Update your 1st document in 10 min. This add-in requires Microsoft Office (primarily Office 365 subscription version). It must be added to Excel and either Word or PowerPoint. Office 365 for Windows (subscription version): requires version 1705 (Build 8121.1000) or later. Office 2016 for Windows (non-subscription): requires version 16.0.4678.1000 or later. Most Office 2016 installed versions are not compatible. Office for Mac: requires version 15.34 or later. Office 2019: all Windows and Mac versions are compatible. Office Online, via OneDrive: compatible, but with some limitations. 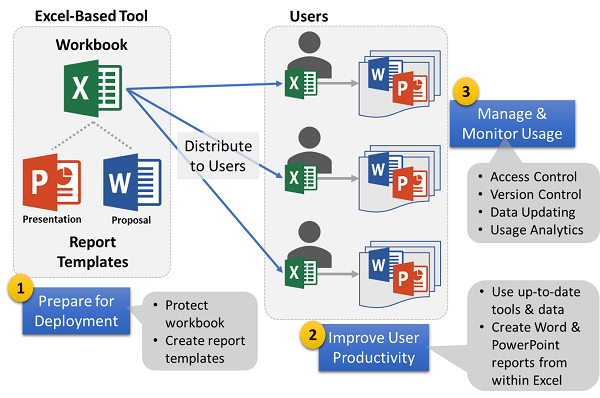 The Enterprise features enable you to create, deploy, manage, and monitor Excel-based tools that are used by multiple users. See how Cisco empowers their employees and partners with these simple, yet powerful, capabilities. 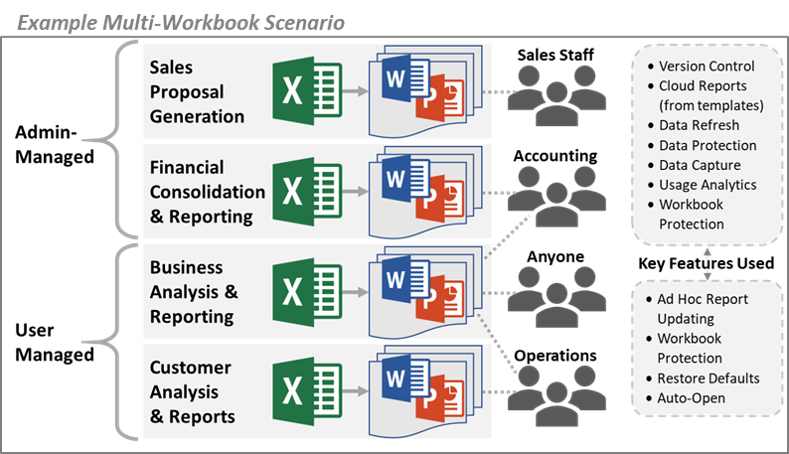 Many organizations have Excel workbooks (tools) that they want to be able to share with multiple users, but have challenges related to version control, security, usage monitoring, and ease of use. The Enterprise features are designed to overcome these challenges. These features allow you to use or author your own Excel workbooks and Word and PowerPoint output reports. You administer the features via the Admin Console (part of the add-in). AnalysisPlace hosts the solution and provides usage data. It is a very cost-effective solution designed specifically for organizations that want to publish Excel-based tools to multiple users. The Excel-to-Word Document Automation Add-In is a SaaS (Software-as-a-Service) solution developed by AnalysisPlace. This add-in is freely available via Microsoft’s AppSource. Users must be registered via AnalysisPlace to receive additional fee-based usage and features. The Enterprise features are added to this solution. It allows you to use or author your own Excel workbooks and Word and PowerPoint output reports. You administer the features via the Admin Console (part of the add-in). AnalysisPlace hosts the solution and provides usage data.